M96 is a barred spiral galaxy in Leo with a faint spiral arm that appears to encircle the galaxy. Along with close neighbors M95 and M105, M96 is the brightest galaxy in the Leo I galaxy group. With a diameter of about 100,000 light years, M96 contains a bright core composed of mostly old, yellow stars with blue knots of young stars surrounding much of the core. One of the most curious features of M96 is the edge on spiral galaxy which seems to be embedded in the outer ring at about the 10 o'clock position. Astronomers believe that this galaxy is actually located about 5 times farther from us than M96 and its apparent juxtaposition in the outer ring is the product of a chance alignment. 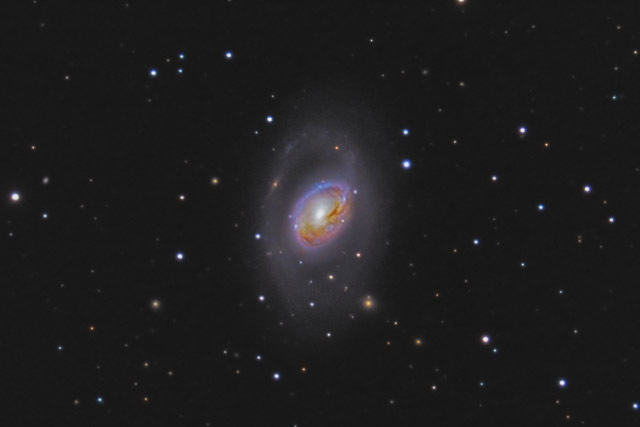 The background galaxy appears reddened due to the intergalactic dust between it and M96. Yet, even more amazing is the tremendous number of galaxies that look as if they are embedded within and around M96 (again, another superposition). Believe it or not, half of the objects "contained within" M96 that appear to be stars are actually distant galaxies. Of 25 "stars" within the halo of M96, I counted 13 which were clearly galaxies! The same holds true for much of the surrounding field. While there are many stars around M96, there are also scads of galaxies. By clicking on the image and studying the enlarged version, you'll notice that many of the "stars" appear quite fuzzy. While some of the real stars are fuzzy as a result of the less than perfect sharpness of my telescope, the objects that don't look quite "stellar" are almost all galaxies! In this image, North is up. This image is cropped to 35% of the original full frame. Software Used Images Plus 4.5 for camera control, calibration, stacking, digital development, Lucy-Richardson deconvolution, multiresolution sharpening, smoothing and noise reduction. Photoshop CS5 used for levels and curves, color balance, high pass filter, star shrinking, saturation adjustments, lab color, sharpening, screen mask invert, and noise reduction. Gradient Xterminator for gradient removal. Carboni Tools for additional saturation adjustments, noise reduction, and smoothing. HLVG for additional color correction. Notes I'm very happy with the final result in this image. It took me many months to finally acquire enough data for a good image, but I think the extra effort paid off well.